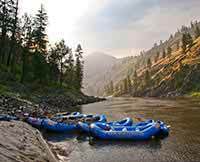 Salmon River – this was a great family trip. My 2 sons and I completed the rafting trip in Idaho on the Main Salmon. We loved the trip; would do it again in a heartbeat.